Yonsei Korean (연세 한국어) is a new set of textbooks written by Korean Language Institute of Yonsei University for foreigners and overseas adult Koreans to acquire Korean language and knowledge of Korean culture. The textbooks are classified into three parts. Yonsei Korean 5-1, 5-2, 6-1, 6-2 for advanced learners. The books are aimed to developing communicative functions based on the learners' Korean ability. They are an integrated collection of various tasks and activities, as well as focused practice of vocabulary and grammar. The activities enhance all four communicative skills of listening, speaking, reading, and writing, which will enable learners to perform a wide range of communicative functions using the Koran language. Yonsei Korean 1 and 2 are basic level textbooks for beginners. It is composed of 10 units. Each unit has 5 lessons. Its goal is to deepen learners understanding of Korean through essential vocabulary and grammar, as well as Korean culture. Yonsei Korean 3 and 4 are intermediate level textbook. It is composed of 10 units with 5 lessons per unit. Each unit covers topics which an intermediate-learner has to know. Its goal is to deep the understanding about Korea through introducing essential vocab and grammar, as well as Korea culture. 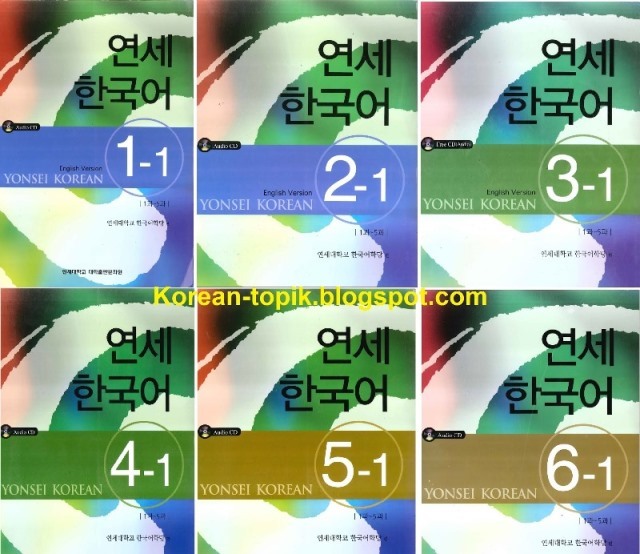 Yonsei Korean 5 and 6 are advance level textbook. It is also contained of 10 units with 5 lessons per unit. Each unit covers topics which an advance-learner need to know, including essential grammar, vocub, Korean culture and way of thinking. If you are living outside of Korea, you can buy the official printed textbook (student's book) and practice book online at Twochois. However, if you are living in Korea, it is better to buy the books at online Korean book stores for cheaper prices such as Gmarket. The ebook version (PDF and Audio) of these textbooks is collected from different source in the Internet, so only textbooks and the corresponding audio are available. If you want to own your own book and practice book, please consider to buy the printed books as mentioned above. Follow the links to download the ebooks. Can you find and upload Yonsei Korean Workbook please? Please read FAQs to learn how to download the files or leave us a message on our facebook page.